Yesterday the movie Rookie of the Year turned 25 having been released in theaters on July 7th, 1993. In recognition of this I wanted to share two of my favorite autographed custom cards. 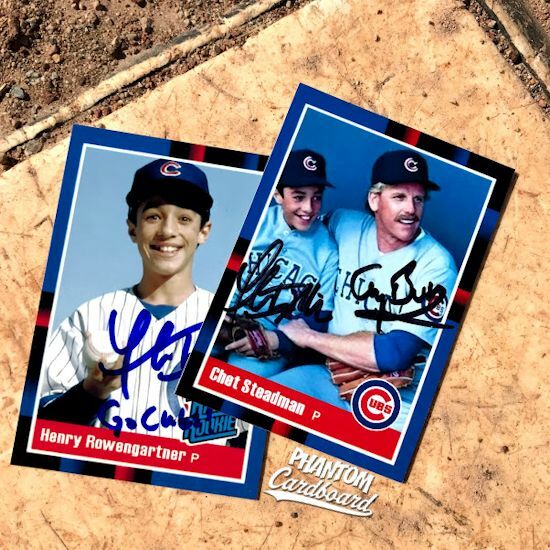 The first is special due to my interaction with Mr. Henry Rowengartner himself, Thomas Ian Nicholas -- with the awesome "Go Cubs!" inscription that was signed at the 2017 Motor City Comic-Con. The second is my Chet "Rocket" Steadman custom card done on the matching 1988 Donruss inspired design. I was lucky enough to get Gary Busey's autograph on it through the mail and then got in touch with Mr. Nicholas to complete the dual signature. I love having my cards autographed and multiple signatures are like holy grails to me. Happy 25th, Rookie of the Year. Now, have some hot, stinky cheddar on me!